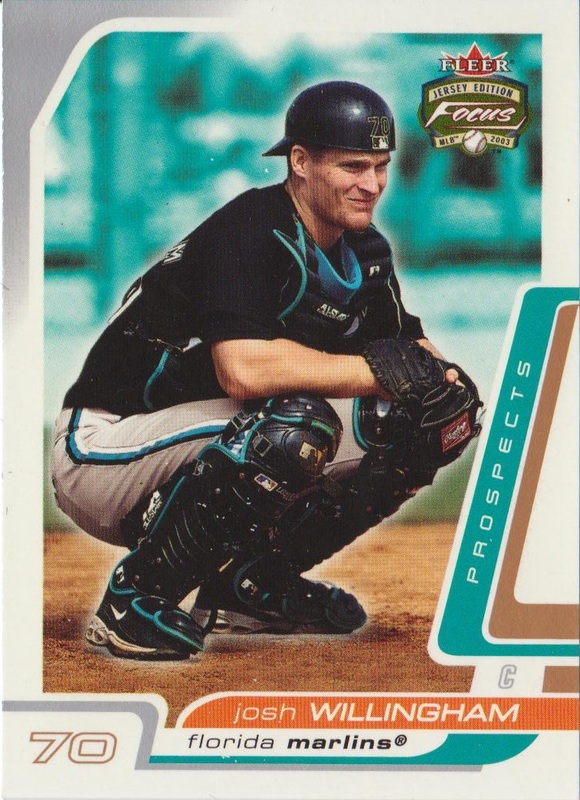 As a 23-year-old, after a couple of years in the Marlins organization, Willingham began playing catcher. Over the next few years he spent most of his time in the minors behind the plate, playing 60 of 66 games there in AAA. In fact, his first promotion to the majors happened because an ex-Twins catcher was experiencing back stiffness. It was Mike Redmond. But catching didn’t last. The plan going into 2006 was for Willingham to get extensive catcher-specific coaching from manager Joe Girardi and bench coach Gary Tuck, who is often credited for molding Jorge Posada into a capable catcher. They worked with him all spring, but on Opening Day he was their left fielder. Even then they planned on him catching a couple of days per week, but by the end of April, he was the full time left fielder. He hasn’t caught since. In the majors, he’s been almost completely a left fielder, laying there 662 in 799 games. While he’s only played first base for four innings in the majors, it’s worth noting that he played all around in the minors, including 119 games at 3B and 68 games at 1B. In fact, in the minors, he was viewed as a possible utility player, though not a middle infield utility player. Of course, the Twins need a right fielder, since it makes zero sense for Ben Revere’s exceptional range and suspect arm to play in Target Field’s tiny right field. Willingham has only played right field 35 times in his professional career. If the move to right field is a deal breaker, the Twins are going to need to do some roster shuffling – or still go get a right fielder. Looking at Willingham’s injury history, one sees lots of indeterminate injuries like a bad back, sore knees and stiff neck. These aren’t exactly injuries that play to the Twins medical (limited) strengths. But the good news is that while his injuries often sideline him for a couple of days, he hasn’t lost too much time to the DL. Not that there haven’t been some serious issues. He had a brutal September in 2007 due to a herniated disc and it sounds like he needs to lots of maintenance to keep his back strong and healthy. In his first year of catching (2003), he ended up have meniscus surgery on his right knee. Just a couple of years ago his season ended in mid-August because of surgery on his other knee. He’s also been on the DL for an Achilles strain (last year) and a stress fracture in his arm cost him a couple of months back in 2005. But the reports almost always have him coming back from lesser problems after a couple of days of rest. Given the organization’s frustrations with players sitting out with nagging injuries, it’s easy to speculate that Willingham is viewed a gamer who toughs things out. Willingham is "kind of a catcher", like Mauer is kind of one.